Nobody Wants to Use the Stairs. After its Cool Transformation, Everyone Loves it! This is a really good way to motivate people to use the stairs instead of the escalator! People always tend to choose what’s more convenient and easy. Whether it be cooking versus eating out, or manual counting versus using the calculator, people want the easiest way to do it. The same goes for using the stairs versus the escalator. Modern technology has enabled people to do things without having to break a sweat, but sometimes, we also need to be reminded of the simple ways of living as it can also bring benefits such as physical and mental health. In this video we found, a group of individuals tried to inject some fun into using the stairs. As most people prefer to use the escalator, they tried to paint the stairs like a piano complete with a corresponding key note for every step. Sounds fun? Well, we think it LOOKS really fun too! And by the end of the experiment, 66 percent of the population who typically use the escalator decided to use the stairs! When we bring out the fun in any task, the load seems a bit lighter. Let us try to do the ‘Fun Theory’ everyday and let life be happy always! One of my fondest memories as a child was playing on puddles of rainwater. I bet many would agree that childhood isn’t complete if you haven’t done this once in your life. Nowadays, I don’t get to see kids of this generation play on puddles during heavy rain. Gadgets have become more interesting rather than exploring the outdoors. Luckily, there’s a new preschool in Japan that lets kids be kids. Blind Dog and Best Bud that Guides Him are Inseparable and They’re Looking for a Family. This cute pair needs a quiet and stable home! Best buds Glenn, a Jack Russell terrier, and Buzz, a Staffordshire Bull terrier, are totally inseparable. Permanently blind, Glenn completely relies on Buzz to do everyday activities. Sadly, the pair was abandoned by their owners and was seen in a sea tunnel in Northern England. Luckily, the two stray dogs were rescued and brought to Stray Aid rescue center in Coxhoe, Durham. In the rescue center, Buzz was seen assisting Glenn find his food bowl, leading him to his kennel and bed at the shelter, and guiding him whenever he goes astray. With its infectious smile, this dog teaches us to stay happy despite our life’s challenges. An 11-year-old Shiba Inu dog named Cinnamon has captured the hearts of many Internet users with its infectious grin. Despite the dog’s seemingly happy disposition, Cinnamon suffers from glaucoma and Cushing’s disease. Andrew Bua, an entertainment attorney in New York, has owned Cinnamon since March 2004, but it was his fiance Ashley Kroop who set-up an Instagram account for the dog, catapulting her to stardom. 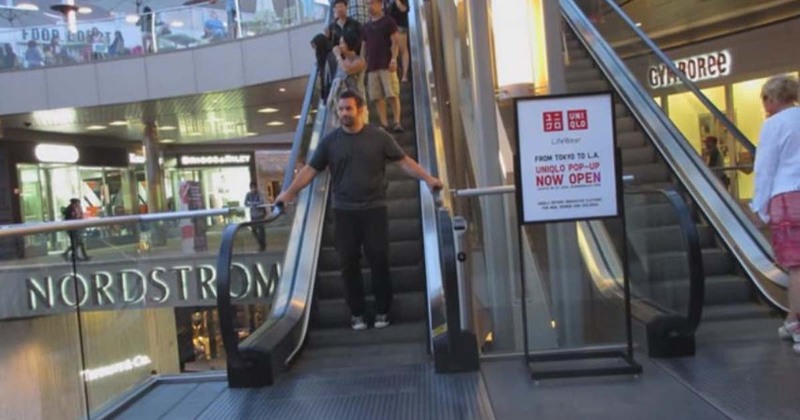 Prankster ‘Magically’ Stops Escalator And Shows How You Can Do It, Too!